The Burke-Gilman trail runs from Golden Gardens Park on Puget Sound, through Ballard, Fremont, the University of Washington, around the western side of Lake Washington and joins the Sammamish River Trail. Total distance is approximately 20 miles. Paved trail, one notorious section known as the missing link, requires street riding. 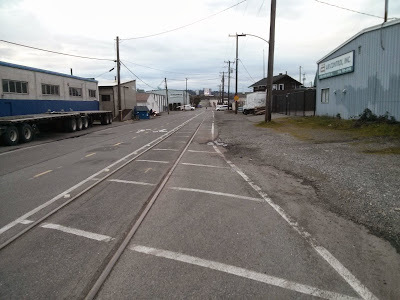 Be sure to cross the railroad tracks at 90 degrees and you'll be fine. If you only do one section of the trail, this 7-8 mile stretch has the fewest crossings, nice pavements, and views of the lake all the way around. Matthews Beach Park is a great place to stop for a swim, and as you approach Kenmore, Log Boom Park is a popular rest stop. 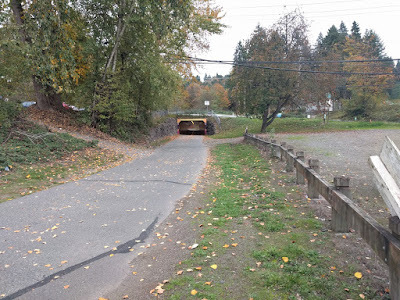 The Burke-Gilman ends - and the Sammamish River Trail starts - just beyond the tunnel east of Wayne Public Golf Course, even though it's the same trail. A large sign marks the transition. Technically, the last bit of the Burke crosses the bridge and passes Blyth Park before ending at Riverside about a quarter mile later, but very few people ride that last segment. After another half-mile, the North Creek Trail to UW Bothell and points north branches off (the bridge in the picture below is the Sammamish River Trail, the path to the left is North Creek). 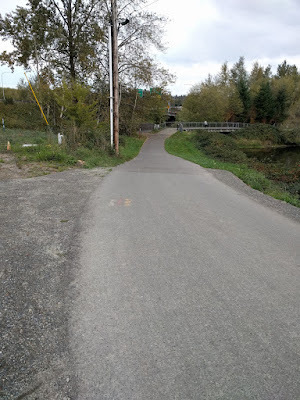 The Sammamish River Trail continues on along the river for approximately 10 more miles before joining a few neighborhood trail networks by Redmond Town Center.